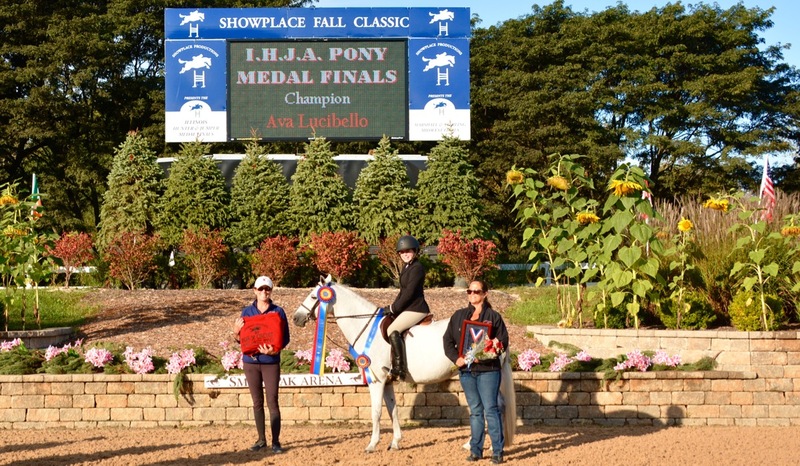 Celia Bresch and Loredo earned the highest first round score of the day with an 88 in the IHJA Junior Medal Finals. Photo Chicago Equestrian. 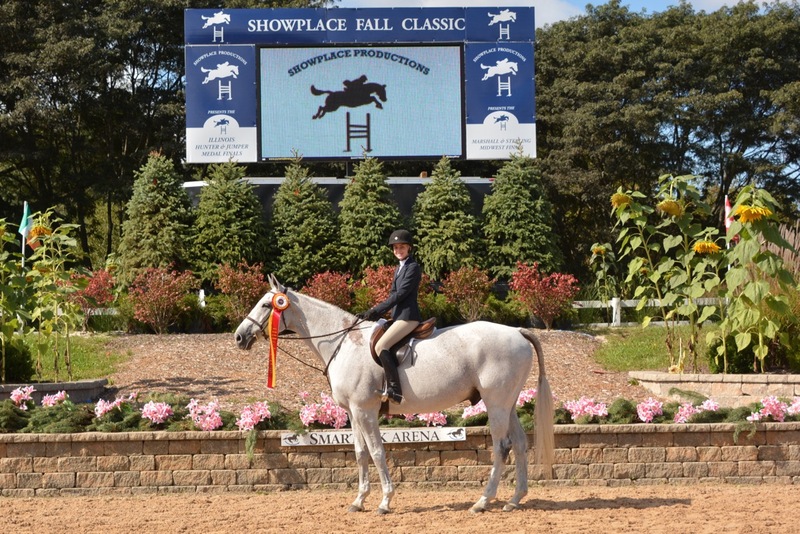 Wayne, IL – September 19, 2016 – Showplace Productions and show manager, Pat Boyle, created a grand finale for riders, spectators and trainers at the Showplace Fall Classic Championship Horse Show that took place at Lamplight Equestrian Center September 13-18, 2016. 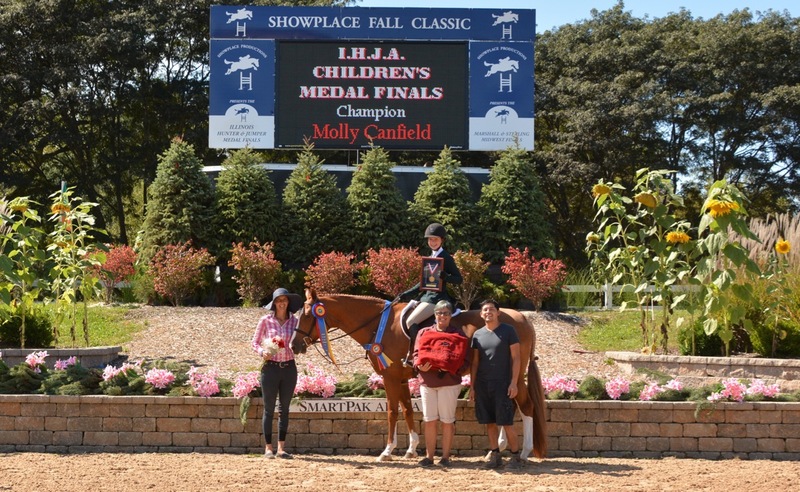 The USHJA Zone V Championship Horse Show featured the Marshall & Sterling Midwest Finals, the $150,000 Marshall & Sterling 1.30m Grand Prix series awards and the coveted IHJA “A” Medal Finals. Boyle and his team make the championships memorable and the finals special, just as they should be. For the final day of competition, the crew spent hours building the extra special course designed by Boyle and Skip Bailey for the Illinois Hunter Jumper Association (IHJA) “A” Medal Finals in the grand prix ring, which included a chute, option jumps, straw bale configurations and a mix of jumper and hunter derby jumps. The course is always challenging but not overwhelming, beautifully decorated and totally fun for riders. Boyle creates award ceremonies that build excitement and are fun for all. 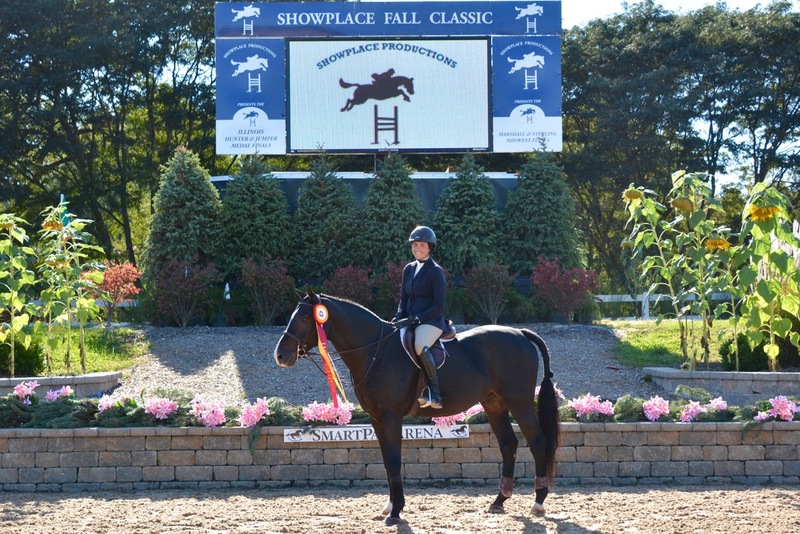 Spectators and exhibitors enjoyed a wonderful luncheon during the finals, thanks to Showplace Productions, which just puts the icing on the cake, making for a perfect final day of competition. As the morning fog lifted, pony riders got the first shot at Boyle’s special track. Judges Diane Young and Chris Wynne gave the rounds a numerical score followed by additional testing for at least the top four riders at the judges’ discretion. Returning to test in the pony medal was Alexis Bauman with an 83, Chloe Watrous with an 81, Olivia Markman with a 79, Ava Lucibello with a 78 and Alex Ortiz with a 77. The test included a trot jump, a simple change of lead and a halt in addition to some canter jumps. The judges changed up the placings after the test, leaving Ava Lucibello with the win after moving up from fourth place. Chloe Watrous was reserve while last year’s winner, Olivia Markman, finished in third place, Alexis Ortis fourth and Alexis Bauman in fifth. Lucibello, 12, of Naperville, Illinois, rides with Judgment Farm in Oswego, Illinois. Now that she has her first medal win under her belt, she will be finishing up the ponies and moving onto a jumper for next year. Jumps were adjusted and then on to the IHJA Adult Mini Medal Finals. Fifteen riders tested their skills in search of the top prize. Lauren Robishaw earned the highest score in the first round with an 81, followed by Stephanie Szymonik with 79, Morgan Goodnow with 74 and Lynne Kubik with 68. Their test was the first four jumps of the course with a halt after jump one and they were to trot the last jump. In this case, the testing didn’t change the order and left Robishaw as the 2016 winner followed by Szymonik. Robishaw is from Chicago and has ridden with Freedom Woods Farm for about 7 ½ years. Szymonik, 28, from Elk Grove Village, Illinois, has ridden with Lorrie Canady at Galway Farm for over 14 years. This was her third try at a medal class and she has never had to test before. Her horse, Lucky Luciano, is a share board horse that likes to turn it on at a horse shows. 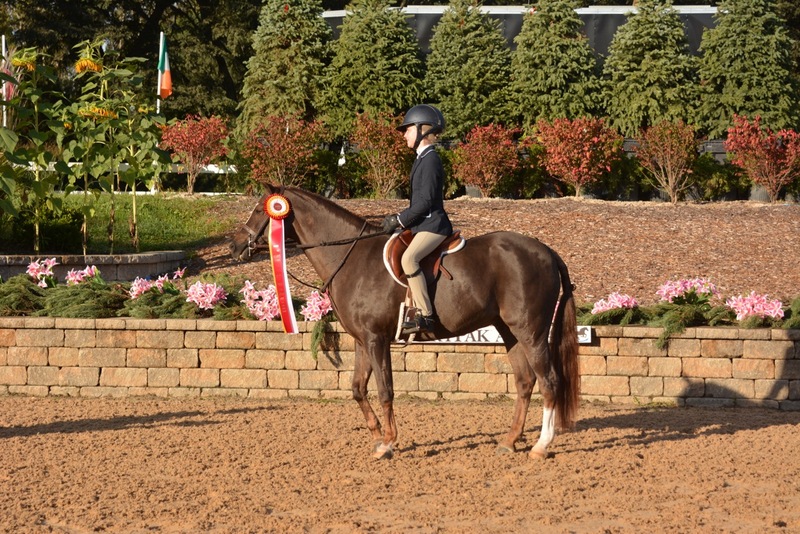 He recently earned The Best Horse Award at the Galway Farm Equitation Classic in August. “I want to thank the whole Galway team for always believing in me and especially the people who take care of he horses every day,” added Szymonik. After a few more course adjustments the Children’s Mini Medal riders had their chance at the finals course. The four riders out of twenty who successfully negotiated the track, returned to test with Vivienne Sleigh scoring an 83 in the first round followed by Emily Axel just behind with an 80, Emily Reuter scored 76 and Jenny Wardeberg following up with a 77. All of the work offs the judges gave, tested the rider’s basic skills within a shortened course. In this group, the test caused the judges to rearrange the order, except for Sleigh, 16, who remained at the top. Sleigh has ridden with Joanne Kurinsky at Littlewood Farm for about three or four years. She leases the horse Fischer from Kurinsky and has had him for two years. She was fourth in the Mini Medal Final last year and would like to move up to the Children’s Medal next year. Sleigh shows in the Children’s Hunter division as well. 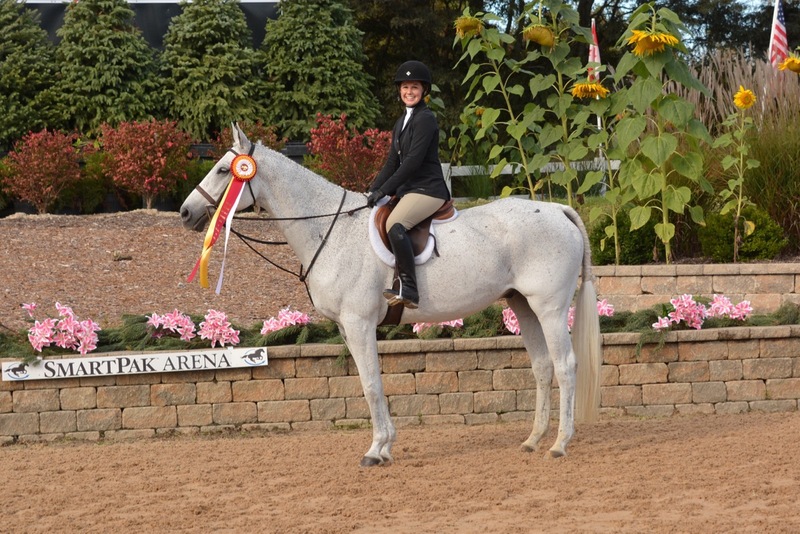 The reserve champion was Jenny Warderberg, 14, who rides with Millennium Farm. This was her first medal finals on a horse and she was able to move up from fourth place after the first round to second place after the test. “I would like to thank Sue and Katie (Leverick) for all of their help and of course, my dad,” Warderberg added. The Children’s Medal Final was the largest group of the day with 24 riders. Molly Canfield of Chicago earned the highest score in the first round, as she set the pace early in the class with an 85. It wasn’t until the bottom of the class when Katie Gilcrest scored an 82. The judges called back the top six riders in this group to test. Britta Stoekel made the cut with a 72, Madeline Cardelli scored 70, Jamie Delorge scored 69.5 and Delaney Hoffman rounded out the top six. Canfield was able to keep her first place spot in the class after the test and Gilcrest kept her second place spot as well. “It was great. I feel really lucky to have the trainers I have and the horse I have so I’m really happy,” said Canfield. 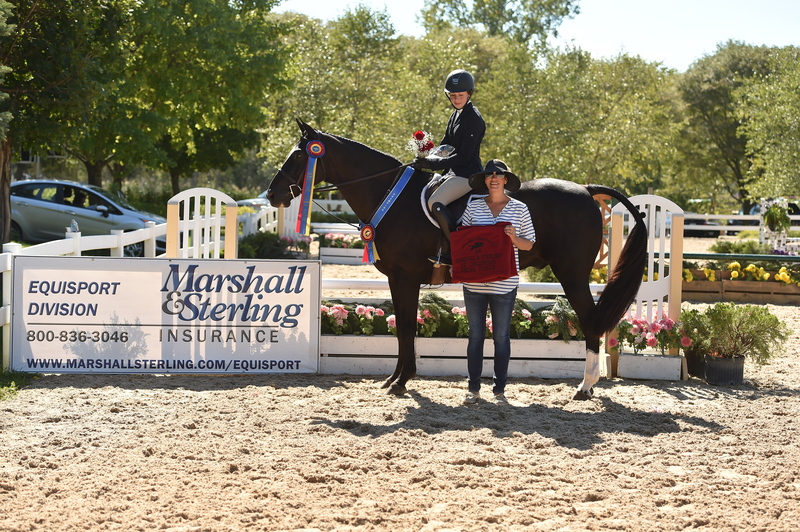 Over in the hunter ring, Canfield won the M&S Children’s Adult Hunter Championships with the same horse, Penny Lane. The pair trains with Lorrie Canady at Galway Farm in Long Grove. Although Penny is a traditional hunter, she doubles quite easily as an equitation horse. Gilcrest rides with Margaret Clayton and Palladia Farm in Libertyville, Illinois. She also just started doing hunter derbies this year. Some fierce and friendly competition went on in the adult equitation. 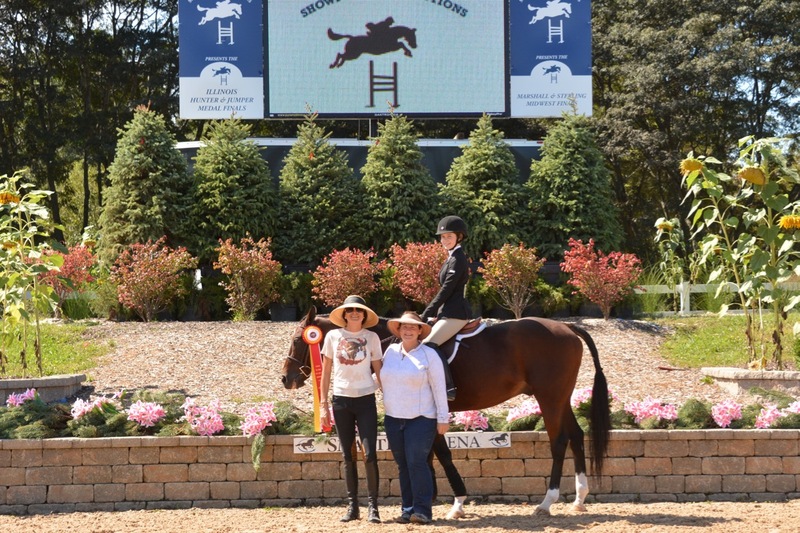 Meredith Wegbreit of Barrington, Illinois, rules the roost in the section since she won both the M&S Adult Medal Finals and the IHJA Adult Medal Finals in 2015. In addition, she won the M&S Adult Medal Final again this year, putting the pressure on the rest of the field. Her biggest rival, Kelsey Concklin, 23, is also a friend and barn mate since they both ride at Greystoke Farm with trainer Lauren Schone. 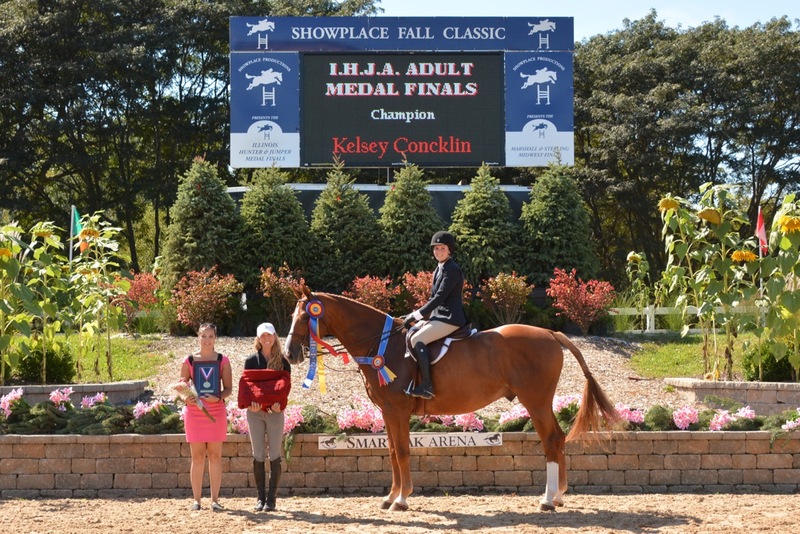 Conklin was second in the M&S Adult Medal Final on Saturday, right behind Wegbreit. The top three scores in the class were only two points apart, with Emily Yslas in the lead with an 82, followed by Concklin with an 80 and Wegbreit with a 78. After the test, Concklin finished on top for the win, followed by Wegbreit while Yslas slid into fourth. “I knew being in third I had to be a little more handy in the test to move up,” said Wegbreit, who took the inside turn to the first jump in the test. “I haven’t been riding this horse very long, so I went around to have a smooth positive ride,” said Conklin about the horse she borrowed from Kevin Babbington through Schone. The day wrapped up with the most competitive final of the day, the IHJA Junior Medal Finals. A majority of the twenty-one riders will be heading to the ASPCA Maclay regional finals this next week in Lexington, Kentucky. Boyle knows what helps prepare riders since his daughter, Caitlin, is an accomplished equitation rider. The course had plenty of options for riders to choose how they could best show off their talents. Boyle’s course included a no stride, a serpentine and an unusual configuration of hay bales set as a line. Scores in the 80’s lined up the riders for additional testing. Each just two points apart, Celia Bresch led the pack with an 88, Giavanna Rinaldi 86, Gia Gulino 84, Aristea Santoro 82 and Claire Stockard 80. Those top five riders were called back for additional testing. Riders were asked to face the outside of the ring so they could not see what the other riders were doing in the test. When the battle was over, it was Giavanna Rinaldi who earned the win for the second year in a row. Her test demonstrated some very tight and accurate turns with a strong canter and some angled jumps, all done smoothly and in perfect rhythm. She had a new horse, which she had only ridden for a week before showing him and he has never done the equitation before. Rinaldi rides with Haylie Rolfe and Maggie Jayne at Our Day Farm in Elgin, Illinois. Also moving up a spot in the work off to take the reserve ribbon was Gia Gulino who rides with Tina Judge-Boyle at Judgement Farm. Gulino was the Reserve Champion in the M&S Junior Medal Finals on Saturday. She is consistently in the top ribbons in the major equitation classes.Gulino is still getting to know her horse as well, using this week to prepare for the regionals. She knew she had to be handy to move up in the work off. 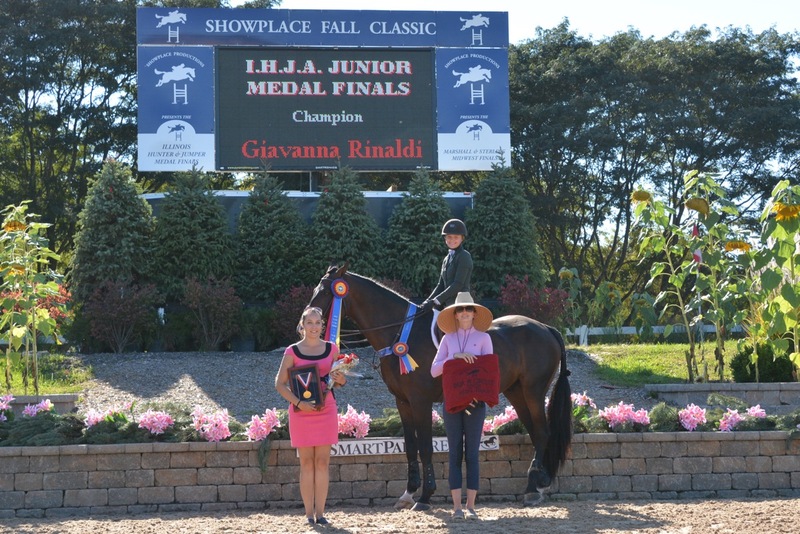 Reserve Champions IHJA Junior Medal, Gia Gulino. Photo Chicago Equestrian. Both girls head off to Kentucky in hopes of securing a spot in the ASPCA Maclay Finals held at the CP National Horse Show at the Kentucky Horse Park. 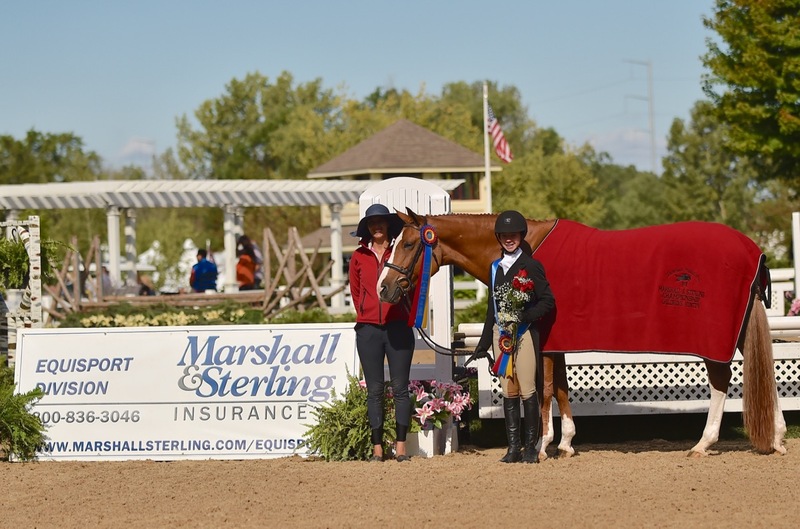 The Marshall & Sterling Midwest Finals also wrapped up with the $1,000 Children’s and Adult Hunter Championships. 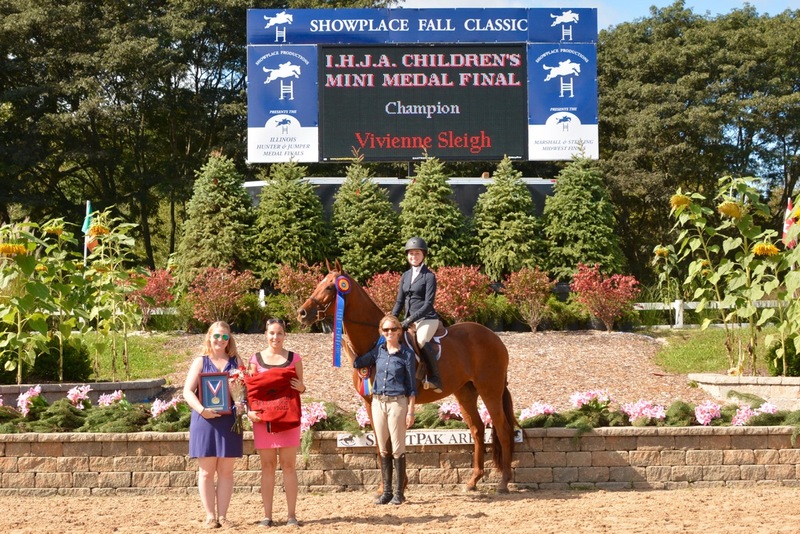 Molly Canfield and Penny Lane, owned by Mary Beth Canfield took the Championship with Vivienne Sleigh and Fischer taking the Reserve Championship. 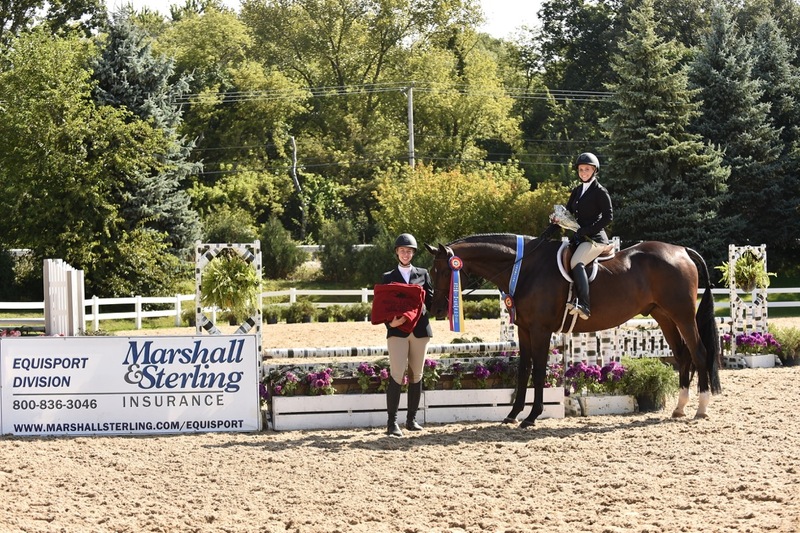 Molly Canfield and Penny Lane won the M&S Children's/Adult Hunter Championship. Kimberly Pevonka won the 2'6" M&S Adult Medal Final. Photo Andrew Ryback Photography. earned the championship while Elaine Ramesh took the reserve. Lauren George won the 2’6” M&S Children’s Medal Final with Vivienne Sleigh taking the reserve. The show closes out decades of horse shows and championships at the Lamplight Equestrian Center, which was bittersweet for some exhibitors and trainers. Boyle has teamed up with HITS to produce a season of shows at the historic Balmoral Park in Crete, Illinois, for 2017, boosting the Midwest horse industry. The new show facility will host numerous premier horse shows and give away millions of dollars of prize money as the HITS brand is known for. 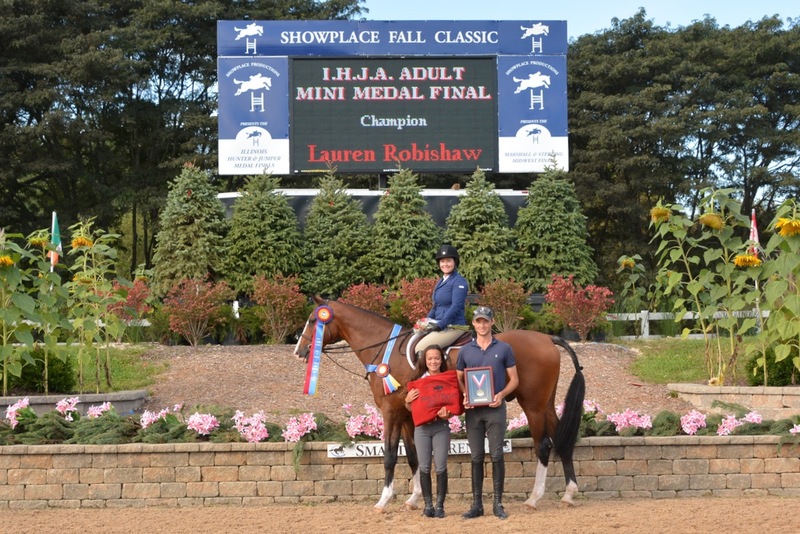 Showplace Productions moves on to the Showplace Fall Finale Sept 22-25 at Ledges Sporting Horses, the Minnesota Fall Harvest Horse Show Oct. 4-9, the to the NIHJA Finals Sept. 29- Oct 2 and the IHJA Banquet, November 12th at the Renaissance Hotel in Schaumburg, where Boyle and his staff organize a multitude of awards for both the A and B circuits and all the divisions for the season. In usual Showplace Productions’ style, the banquet is an evening of amazing prizes, a video production by Star Creek Video, dinner, dancing and celebration. For a complete list of results, visit their website at www.showplaceproductions.com. 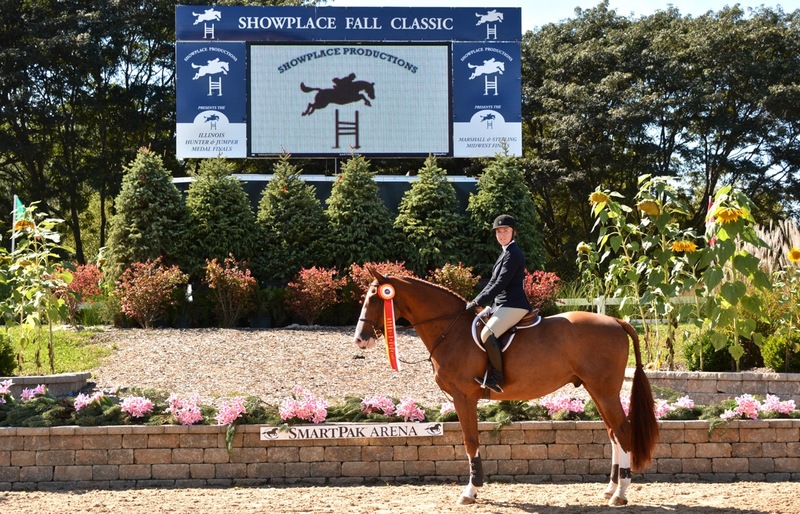 Watch for the 2017 schedule of Showplace events at Hits Balmoral Park. Photos are copyright material and may only be used in relation to this release.